Also known as the Hawkeye State, Iowa sit in the midwest of the United States with the Mississippi River on the east border. On the west side of the state, the Missouri River and Big Sioux River flow. It is the only state that only has rivers flowing to create both its eastern and western borders. 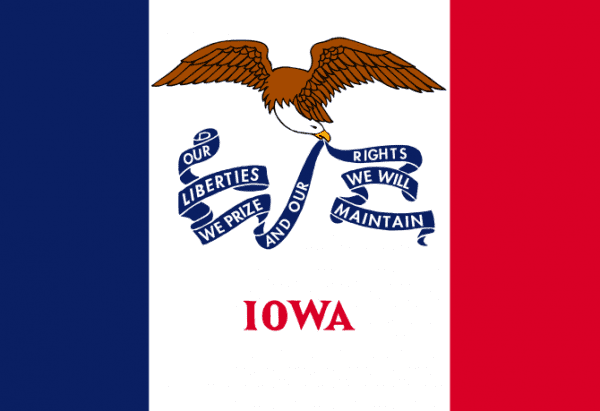 Iowa’s state flag is has the pattern of a French national flag and that is because it was originally part of the French Louisiana territory until it was voted into the union in 1846. Iowa is ranked 26th in the nation in area of land and ranked 30th for population with over 3 million residents. The largest city and metro area lies around Des Moines, Iowa’s capital. Also it is ranked as the safest state to live in. Searching for Iowa’s scrap yards and current scrap prices is easy with the iScrap App. In areas like Des Moines, scrappers can search for yards in the area and also see the current scrap prices being paid. If Iowa scrap yards decide not to list their scrap prices, users can report prices on the iScrap App directly. With a few simple clicks and reported scrap prices, scrappers can give other scrappers in the area a current scrap price update. Iowa’s economy relied heavily on agriculture in it’s earlier years but has since transitioned to also have more modern industries that make up it’s work force. While it has been known to be an agricultural state, Iowa has a lot of manufacturing throughout the state with corporate headquarters for food companies and other industries like steel, construction equipment, and more. Because it is a much more modern industrial state, Iowa was able to bounce back from the recession in 2008. That can help you to know that you can find some good quality scrap yards in Iowa to recycle your metal with. Whether you are looking to recycle your copper, aluminum, steel, or other scrap metal. Or if you are looking to get a spare auto part with a local salvage yard in Iowa. The Iowa Scrap Yards can be found on the iScrap App. You will be able to search them for the on the Iowa Scrap Yards map and search the popular areas like Des Moines, Waterloo, Davenport, and Cedar Rapids. Find the current scrap prices and contact local yards for container services for your local scrap yard jobs.